« EID 2012 KC Sea Life Aquarium! The collection of saxophonist, composer, and educator Ahmad Alaadeen has been donated to the LaBudde Special Collections and Marr Sound Archives in the Miller Nichols Library at the University of Missouri-Kansas City. Fanny Dunfee, widow of the acclaimed Kansas City jazz icon, donated the collection, which includes arrangements, music manuscripts, photos, memorabilia, performance videos and audio tapes along with other material related to Alaadeen’s life and career. A 2010 recipient of the American Jazz Museum’s Lifetime Achievement Award, Alaadeen was born and came of age musically in Kansas City. He first picked up the saxophone when he was in sixth grade, and later studied with Leo H. Davis, a revered music teacher at R.T. Coles High School. Alaadeen’s professional debut was with Davis’ concert band when he was 14, playing E-flat horn. 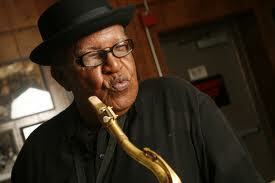 His first major job was playing baritone sax with the great pianist-bandleader Jay McShann. Alaadeen attended the Kansas City Conservatory of Music, now the UMKC Conservatory of Music and Dance, and continued his education at St. Mary’s College and DePaul University. He served in the military during 1957-59, taking on the job of jazz saxophonist and principal oboist with the 4th Army Band. Over the course of his performing career, he worked with such jazz luminaries as Miles Davis, Billie Holiday, Ella Fitzgerald, the Count Basie Orchestra, Della Reese, Eddie “Cleanhead” Vinson, T-Bone Walker, Claude “Fiddler” Williams, and also alongside noted R&B stars, including Rufus Thomas, Carla Thomas, Gladys Knight, Smokey Robinson, the Temptations, Four Tops and Sam Cooke. After returning to Kansas City, Alaadeen became a well-respected educator, teaching jazz in both the school system and privately. In 2009, Alaadeen authored The Rest of the Story: Jazz Improvisation and History, a method manual in which he shares the secrets of how he learned music, passed down to him by the masters. Alaadeen was the recipient of the Jazz Heritage Award, the Missouri Humanities Council’s Community Heritage Award, and the Missouri Arts Award. In 2004 he was presented Kansas City’s Lifetime Achievement Award. Alaadeen passed away from cancer on August 15, 2010 at the age of 76.